Arena Five: Summer Reading is the BEST. 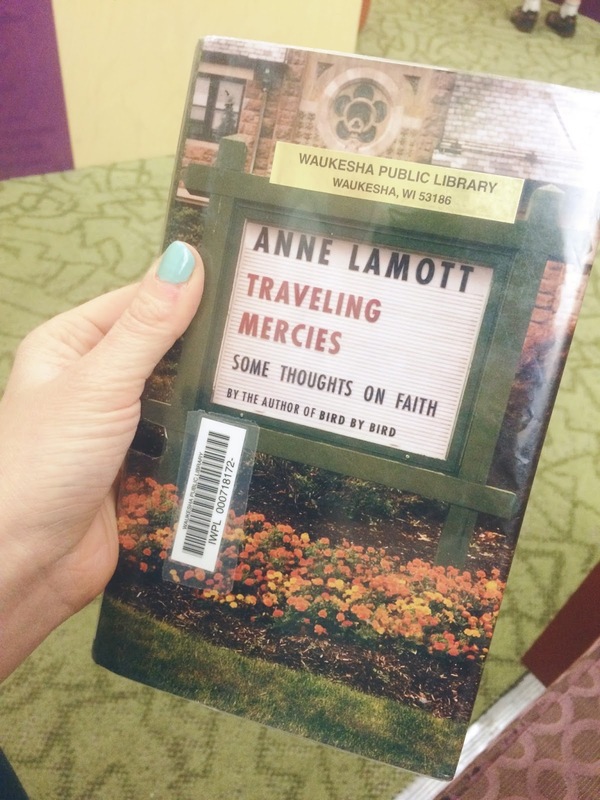 The subtitle of this post should probably be "My Overdue Stack of Library Books." I get all excited when I go through my list of books I want to read and then I find myself on our library website pushing buttons that lead down a road of HOLD ALL THE THINGS! And then suddenly there is a stack on my desk, my nightstand, in my purse. It's a great problem to have, I suppose - too many great books to read - but then again the whole free aspect of the library does lose its luster when you keep racking up late charges. One of the best things about summer is BOOKS. I don't magically find myself with more time to read during the summer or anything, but there is just something about a warm day, a gentle breeze, a cold beverage and a comfy seat in the backyard that makes me want to get lost in a book and never come out. I know I'm not alone in this. Summer is a bookworm's paradise because all the other bookworms come out of hiding and start to go buck-wild with sharing their favorite books that they are also reading by campfire light, or on a beach, or in the car while road tripping. 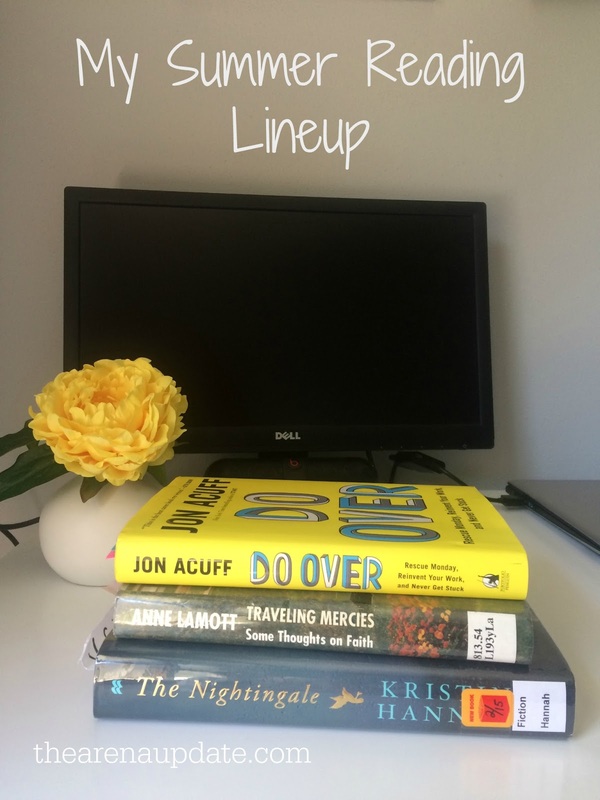 Summer is prime time for finding your next favorite book. Here are some of the books currently on my reading list that I am excited to dive into this summer. The Nightingale by Kristin Hannah - set in WWII France, this is the story of two sisters who are about as different as God ever created two people. I started this one about a week ago and it is really lovely so far. Looking forward to seeing where this one goes! Do Over by Jon Acuff - A friend of mine who is the kind of friend everyone needs in their life, sat down with me for a chat about the hopes and dreams I have for my career and how I imagine using my gifts in a way that blesses others and allows me to earn a living too. I figured I was nuts to dream such a thing. She showed up to that conversation with a fresh copy of Jon Acuff's new book. I dove in and I am not even kidding you, I need to write a whole other post on the magic of this book. Thinking about a career "do over?" This is your book. And I'm only a few chapters in! 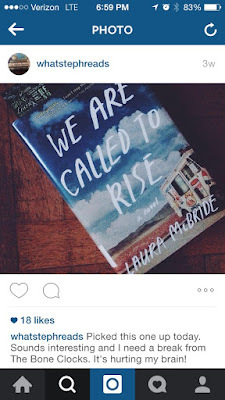 We Are Called to Rise by Laura McBride - Have you ever grabbed a book off the shelf simply because the cover was cool? That's what I did with this one. Unfortunately, I added it to my pile of books only to allow it to slip down the priority list until I had already renewed it twice and had to get it back to the library before I was completely broke. Of course, the very day after I returned it, Stephanie Howell started a new Instagram account devoted specifically to the books she was reading and this one was her very first post. (Check out @whatstephreads on Instagram for her wonderful book suggestions.) Of course, now I absolutely MUST have this book back in my life. For the Love by Jen Hatmaker - This one doesn't even release until August 18th and I am already chomping at the bit to read it. But first, a little background. A while back, Jen Hatmaker put out a call to her people that she was building a launch team for this book. She would be accepting 500 people onto that team and the applications started to pour in. When all was said and done, the 500 person launch team was chosen and super-sweet emails were sent to the other 4500 applicants to let us down easy. Yup, I'm a proud member of #the4500. Now, because Jen is awesome, that rejection email included four sample chapters from this book in PDF form and OHMYFREAKINGGRACIOUS. All my dreams of ever writing a book went flying out the window because This is the book I have always dreamed of writing. Only, Jen beat me to it. She discusses the rules about wearing Leggings as Pants and about how our kids' homework is rapidly becoming like another job for parents and that we need to stop the madness. I was laughing so hard I was crying and many times I wanted to shout out, "Amen sistah!" August can't come fast enough. 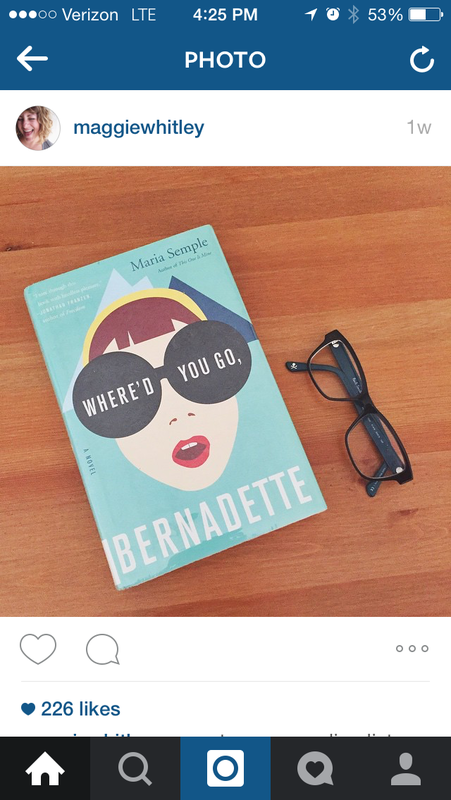 Where'd You Go, Bernadette by Maria Semple - Seriously. This cover. I can't even. Me Before You by Jojo Moyes - Because clearly I'm the only one left on the planet who hasn't read it. All the Light We Cannot See by Anthony Doerr - After the rave reviews this one got from Jessica, it jumped up a few notches on my list. Searching for Sunday by Rachel Held Evans - People are saying amazing things about this book and considering I work at a church, and the conversations I have had with people about how they have been seriously wounded by the Church, I really want to read it. Someone Knows My Name by Lawrence Hill - Another one that sat on my nightstand until I ran out of time. Never got to even start it. Sad face. Texts from Jane Eyre by Mallory Ortberg -The idea of all those famed characters from the classic literary masterpieces texting one another is both ridiculous and genius at the same time. Word on the street is that this one is hilarious and every summer needs a good, light-hearted read. Make it Happen by Lara Casey - Spoiler Alert: I'm on the brink of a pretty big leap of faith and it's kind of scary when I sit still long enough to think about it and allow doubt to penetrate my mind. The subtitle for this book is "Surrender Your Fear. Take the Leap. Live on Purpose." YES. By the way, I'm not sure where this has been all my life, but I recently discovered that a lot of my well-read friends were hanging out on an app called Goodreads where they can keep track of the books they are currently reading, create a list of books they want to read next, rate books, and get recommendations from friends. It is fantastic. If you're not already using it (which I doubt), definitely check it out. Do you have dreams of reading stacks and stacks of books this summer? What would you add to this list? What have you read recently that was so fantastic you just want to shout it from the rooftops? Shout it out in the comments! Disclosure: Affiliate links used for these books and some screenshots from Instagram. All thoughts, opinions, and book obsession all my own.